It seems that a fair share of Dutch University flags consist of many horizontal stripes in unrepeated colors (rainbow flags). A calendar for 1900 by T. van der Laars [laa99] with flags and coat-of-arms shows for Groningen a flag with horizontal stripes of red, white, yellow, purple (? ), blue. This one has proportions 1:2 and has a swallow tail. A calendar for 1900 by T. van der Laars [laa99] with flags and coat-of-arms shows a flag labeled «Facult.kl. Leiden» (= Faculty colours Leiden): horizontal five stripes dark green (? ), red, black, white and blue. Light Blue - Social sciences. The University has in fact got 7 Faculties: the rest are either sub-faculties, inter-faculties or core-faculties, and can all be brought under one of the main faculties. 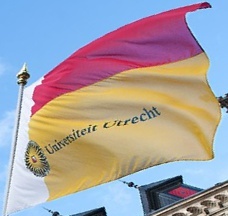 This flag as described is not used by any other than the Utrecht University, although I do not know if any other Dutch university has a similar flag with different colours. A calendar for 1900 by T. van der Laars [laa99] with flags and coat-of-arms shows Utrecht’s Faciliteitskleuren (= Faculty colours) red, yellow, blue, pink (? ), green (?). I know of a flag Universiteit (University), seven horizontal stripes: light blue, dark blue, yellow, purple, pink, red, green. It is ordered now and then by several universities in the Netherlands.